Two British fighters, with 32 wins and no losses between them, are both on the cusp of something special. 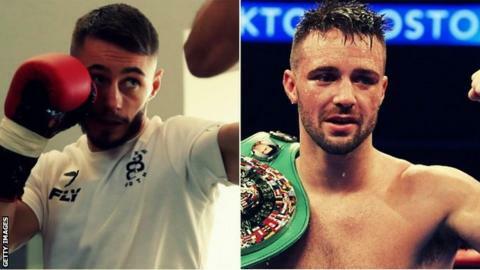 When Northern Ireland's Ryan Burnett and Scotland's Josh Taylor take on dangerous overseas opponents at Glasgow's SSE Hydro on Saturday night, each will know the price of a slip-up. Burnett, at bantamweight, and Taylor, super-lightweight, take their first steps in the World Boxing Super Series, with world titles and the hopes of career-defining fights in line in the next 12 months. Taylor, 27, is "the best 140lb fighter in the world" according to his promoter, former world featherweight champion Barry McGuigan. Undefeated in 13 outings, he knows a win over American Ryan Martin, 25, will take him to the Super Series semi-final and a guaranteed world title shot against IBF champion Ivan Baranchyk. Another win there would ensure he also shoots for the WBA title in the final. "I feel like it's my time to shine," Taylor told BBC Sport. "I've trained all my life for these next three fights to become world champion and can't wait." Edinburgh-born Taylor says he feels like "King Kong" going into the contest but McGuigan has warned him facing another undefeated fighter "will always be difficult". "I think it will be the toughest test to be honest," added Taylor. "I'm really calm about it, no nerves, no anger. He is a typical American style - slow feet, fast hands - but I have the edge on him in all departments." Unlike Taylor, Burnett has already achieved his world-title dream. At just 26 he holds the WBA world bantamweight title and has already won and vacated the IBF version at the 118lb weight. Now, a chance for a third comes, with the vacant WBC title - as well as his own WBA strap - on the line when he meets Philippines-born Nonito Donaire, a former world champion at four weights. "Believe it or not Nonito has been a hero of mine," Burnett told BBC Sport. "I have always looked up to him and thought 'wow what a fighter'. He's got power and the track record to prove it but I've been in with people with power and know how to deal with it." Burnett was homeless for six weeks in 2013 and lived in car with his father after splitting with former trainer Ricky Hatton. Now under the guidance of Adam Booth, he knows wins in his next three bouts would secure the bantamweight Super Series. Moreover, he would be an undisputed champion as all four world titles are in the tournament. "It's an incredible prospect," he added. "It's the best facing the best and more world titles. That made a lot of sense to me and we jumped at the opportunity." What is the Super Series? Organisers expect around 6,000 fans at the Glasgow venue on Saturday for the latest edition of the Super Series. Season one of the event saw Oleksandr Usyk sweep to the cruiserweight title and Britain's Callum Smith, 28, win the super-middleweight tournament. The popularity of the simple tournament structure saw a second season launched, with tournaments at bantamweight, super-lightweight and cruiserweight. McGuigan says the guarantees provided by tournaments "circumvent the politics" of boxing, though warns Martin will be a threat to Taylor's progression. "Ryan Martin is very capable, young, ambitious, fit as a flea, unbeaten and in never tasting defeat, that type of fighter will always be difficult," said McGuigan, 57. "It will be a real test of Josh Taylor's abilities. I believe Taylor will measure up to the task. We have the best 140lb fighter in the world." Analysis - Can Burnett overcome 'breathtaking' rivals? Burnett has often said he performs better against better opposition and this tournament will certainly give him a chance to prove it. His performance in Glasgow will invite comparisons with compatriot Carl Frampton's points win against Donaire last April, when Frampton controlled the contest from the outset. Generally the sharper, Frampton had repeated success at medium- and long-range, with Donaire - now 35 - often loitering in the pocket at the end of exchanges as though old instincts had deserted him. When I interviewed Donaire afterwards, he couldn't resist including an expletive in his reckoning that Frampton - at featherweight - was "too big". Was that code for "too busy, too accurate and too hungry"? Burnett should have all three factors in his favour as he chases a place in the semi-finals of a tournament of breathtaking quality. Josh Taylor could go on to make a lot of money. He'd also be able to probably look back on seven or eight fights, five or six of which will have been about as good as it gets. It's like a Carl Froch sequence of fights. Carl had, for me, the best sequence of fights of any British boxer. That's the territory that Taylor is wading into. But it's three fights away, and in none of those coming up does he start as a heavy favourite. It is a big, big chance for Josh Taylor as, if he gets there, there's every chance he'd meet American Regis Prograis in the Super Series final and so the limelight would await with the chance to boost his profile immeasurably. You get the impression Taylor, more natural at the weight, will be too clever - but Martin is an unbeaten fighter and you never know what they may produce.